As I was wandering around the aisles of Walmart to check out the new beauty launches, I stumbled across the L'oreal Colour Riche single shadows. 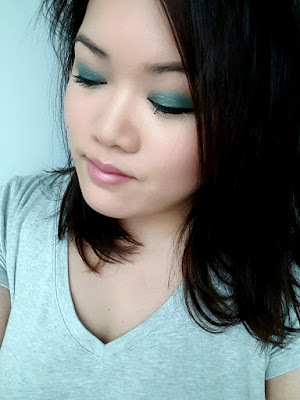 I swatched a couple of them, and decided to go with this beautiful teal color called "Teal Couture" and was inspired to create a look for my Makeup Monday series. 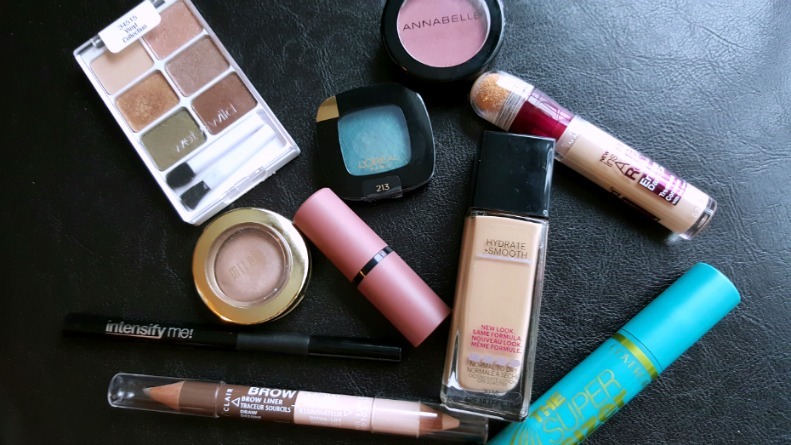 To top it off, I decided to use all drugstore makeup products! Before I proceed with the products used to create this look, I want to give you guys my thoughts on the product as I was swatching a majority of them. These shadows come in a matte formula and a shimmer formula that is almost like a pressed pigment. Be careful with the shimmer formula as they do become loose quite easily if tossed around too much. Mine was lifting in the bottom right corner, but it could be easily fixed by pressing it back into the pan .Think loose pigments, that are packed in it - because of the gel-like, mousse-ish texture of the shimmer pigments, it is a more fragile consistency. The matte shadows are okay, blendable - the most disappointing of the matte shadows would have to be the black one. It isn't black enough. As for my favorite of the matte ones, it is Cafe Au Lait. For the shimmer ones - my favorite is this one of course that I picked up, Teal Couture and the next one is Pan Au Chocolate (which is a beige, brown almost taupe-esque) color. It is so beautiful and that is the next one I need to pick up! 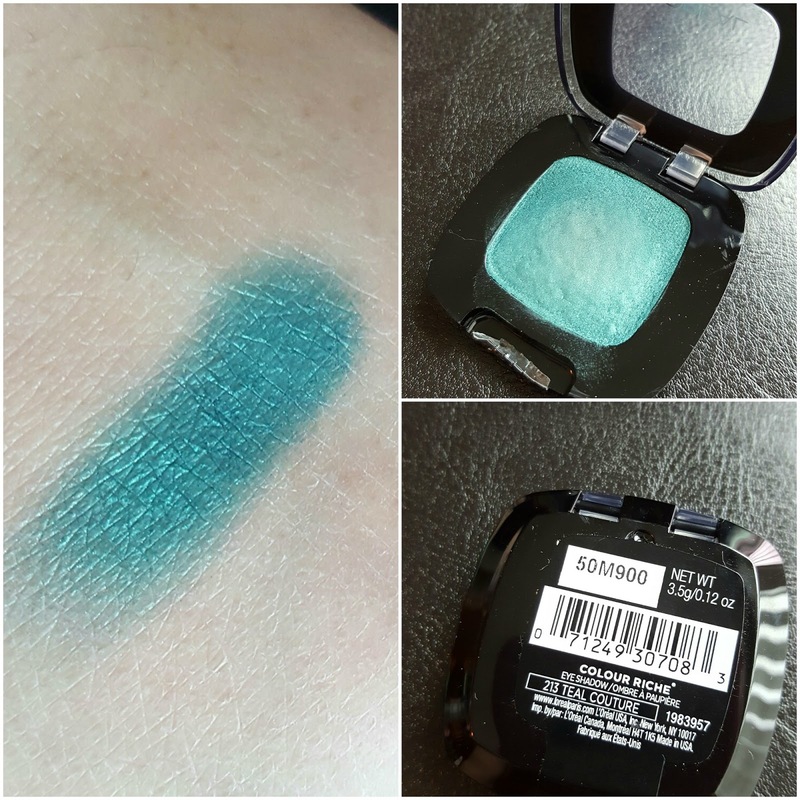 The most disappointing of the shimmer shades I think is Grand Bleu, I was expecting a beautiful sapphire ultra pigmented and bold blue, but even when swatched with my finger, it was just a bit lacking lustre. It wasn't bold enough nor was it pigmented enough. The suggested application of these shimmer ones would be to apply and pack it on your lid with your finger. I tried various brushes, and none of them delivered the pigmentation I desired. Using the finger and with a few dabs, I didn't even have to apply 2-3 layers. One was enough to create this look. These retail for around $6.20 (approx) at Walmart. All the products pictured above are pretty self explanatory - I used the Milani single shadow to blend and buff out any harsh lines of the teal shadow and then used the Wet and Wild darker brown shade to do a bit of contouring on the outer crease.